★★★★★ FREE Sandbox game ★★★★★ Craft & Build & Destroy & SurviveRealmCraft is a sandbox construction game with 3D procedurally generated infinity world. *** GAME FEATURES ***•	3D Sandbox free construction game;•	MULTIPLAYER beta mode to CHAT with the real people online;•	Free to play;•	RPG elements;•	Build house;•	Explore world in rpg elements game;•	Huge world to explore;•	Main Crafting and destroying everything;•	Build your own shelter;•	Go deep into the mines;•	Gather resources to survive;•	Fight your enemies;•	Creative mode to set your imagination free.Create and break apart various kinds of blocks, explore the environment, gather resources, kraft weapons, build shelter and take part in combat with dangerous opponents.RealmCraft is a game for adults and kids, it will entertain you for a long time and earn an unforgettable experience. Online Multiplayer beta mode for playing with your friends! In RealmCraft multiplayer beta mode you could play with REAL people online: •	Get together in one world to show the most amazing buildings to each other! •	Discuss in real chat game features or game quests; •	Give advises to people online how to build their shelters/houses/towns! •	Have fun with friends! •	Get the most amazing experience!Connect to the EPIC survival / action or explore & adventure.The game offers two modes – Survival and Creative sandbox. ►	In Survival mode players have to collect resources, hunting, crafting item, construct buildings, fight against enemies, manage hunger and explore world to survive and prosper. ►	In Creative mode you focus on breaking new grounds of creation by building the most elaborate structures you can dream of. ★★★★★ Explore and Create ★★★★★Build, delete, move, fly, jump and mine, craft in free sandbox game.Online Multiplayer beta mode for playing with your friends! 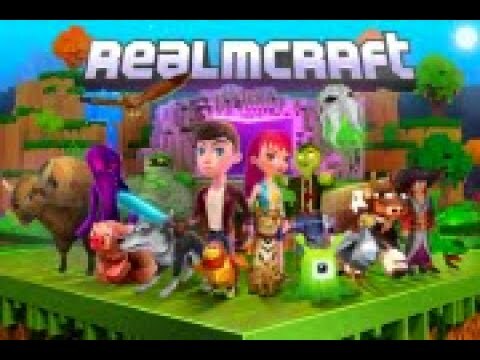 Follow RealmCraft on:TWITTER: https://twitter.com/TellurionInfoFACEBOOK: https://www.facebook.com/RealmCraft.Game/YOUTUBE: https://www.youtube.com/channel/UC2jqGx9MXCUJjYZY_f19vugFORUM: http://forum.tellurionmobile.com/INSTAGRAM: https://www.instagram.com/tellurionmobile_games/VK: https://vk.com/realmcraftgameRealmCraft Official Website:https://realmcraft.app/________________________________________________________________________________________RealmCraft is not an official Mojang application. This game is not associated or connected with Minecraft Pocket Edition. Minecraft is a trademark of Mojang and it is not endorsed by or affiliated with the RealmCraft game’s creator or its licensors. Thank you for playing our app. We’ll appreciate if you give us a 5-star review. Don’t forget to share our app with your friends :)- Added fireworks: you may use it to create decorative explosions!- Added emoji into the multiplayer chat: now you can express your emotions clearer :)- Improved the performance of the app.- Moved the eyedropper tool from the hotbar into the backpack: now to copy some block you should first take the eyedropper from the weapon tab of the backpack.